I’m sure this is a topic I’ll revisit or touch on many more times in the future, but there really isn’t anything much more fun for a quilter than a baby quilt, how ever one defines it. 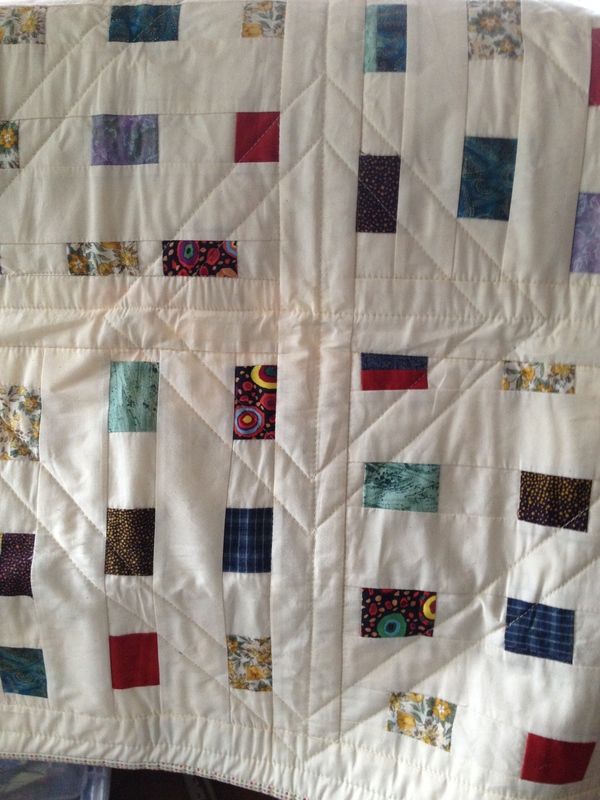 My preference is small quilts for tucking in around a stroller or car seat, or for tummy time. My terms are “Use it Up and Wear it Out!” No more quilts until you wear this one out! Others take a longer view, with bedsize quilts and heirloom patterns and techniques. We quilters occupy a large and friendly tent with room for all. Some I’ve mentioned before, so they will look familiar…. 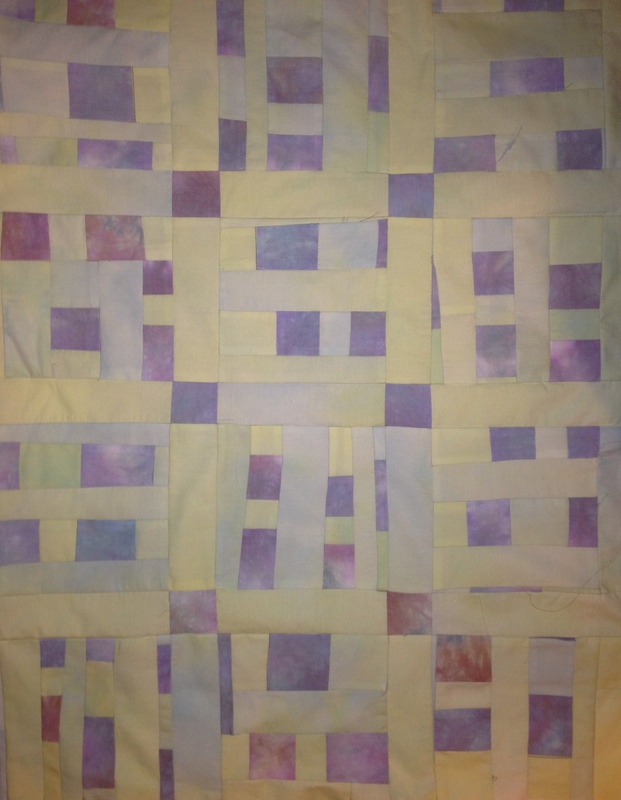 The Jelly Roll Quilt, one of a pair made from 20 2 1/2″ strips of Kona Cotton. The Puzzle Quilt, made with patterned Kaffee Fassett fabrics and solid Quilter’s Linen fabric in one of my five favorite colors of blue. Some I will need to mention again, soon, in greater detail, so they will look familiar…. 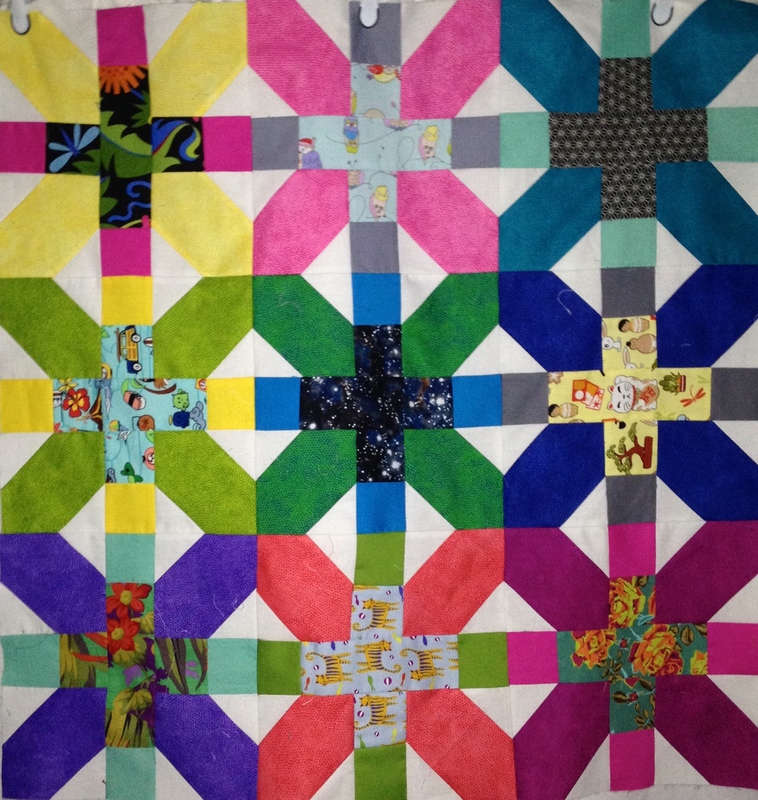 This pattern is called “X and +”, and was very popular among Modern Quilters in 2012. I used Kona cottons, Dimples, and focus fabrics out of my huge scrap pile. Information is available all over the Internet if you can’t wait for my explanation! And this is intended to be a variation on Stacy Sharman’s Inprovisational Confetti Quilt pattern. Her class was great when I took it a couple of years back, I’ve made two or three iterations of the pattern, but…I lost the directions, so may have improvised on the improvising, this time. These are my own hand dyes, and only two pieces – one a light purple to reddish and the other buttery to greenish. Really satisfying and quick. For the record, I did do another Confetti Quilt last Summer, just big enough to tuck around a stroller baby. I’ve also included a picture of the label on the back, but with her info removed (for privacy…). Please label your quilts. For everyone’s sake. 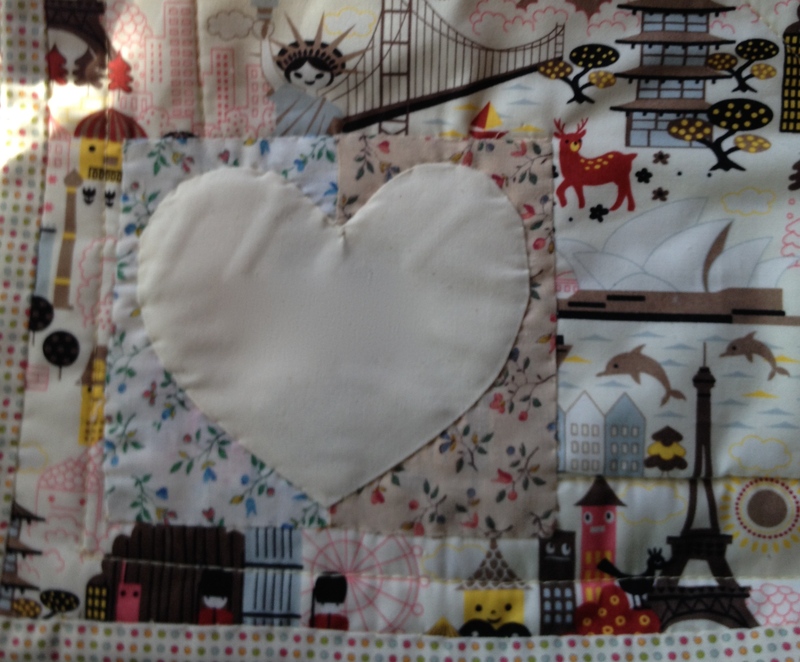 This entry was posted in Baby Quilts, gifts, Scrap Quilts and tagged baby quilt, baby quilts, gifts for family, handmade gifts, jelly rolls, projects, quiltlets, quilts, scraps. Bookmark the permalink.